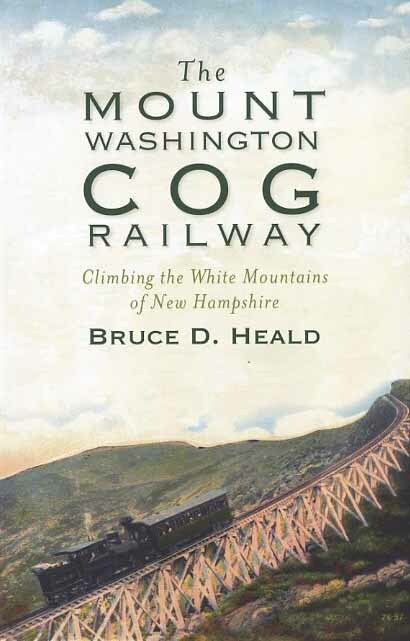 The Mount Washington Cog Railway: Climbing the White Mountains of New Hampshire, by Bruce D. Heald, 2011. Written by a prolific White Mountain author and historian, this book details the fascinating story of the Cog Railway, and also outlines other interesting aspects of Mt. Washington history, including mountain folklore, the Auto Road, the summit buildings, hiking trails, and the story of the proposed electric trolley. Also includes a chronology of historic events on the mountain and a listing of Cog locomotives. Illustrated with many interesting vintage photos. 128 pp., 6" x 9."